Atheneum Books for Young Readers, New York, 2016. 36 pages. I once had a co-worker who especially enjoyed picture books where someone gets eaten, and I’ve gained an appreciation for them myself. In fact, I’ve got a Pinterest board with this theme. Such books are especially good when they add an unexpected element. 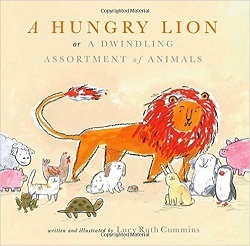 Once upon a time there was a hungry lion, a penguin, a turtle, a little calico kitten, a brown mouse, a bunny with floppy ears and a bunny with un-floppy ears, a frog, a bat, a pig, a slightly bigger pig, a woolly sheep, a koala, and also a hen. The assortment of animals on each page rapidly dwindles. But just when you think there has been off-stage violence… we see that the animals were preparing a surprise party and a large cake for the lion! But alas… the cake does not, actually, stop the off-stage violence. And then who should show up fashionably late to the party but a “really ravenous T. Rex”! The lone survivor from the original assortment of animals is a satisfying surprise. Like I said, I wouldn’t necessarily use this with preschoolers or any child who will be distressed by the sweet animals who disappear. But a child who enjoys I Want My Hat Back would be a good audience for this book, or any child who is learning to make inferences and read between the lines (and pictures). Though it’s better if the inferences they make do not distress them – so this is a bit better for kids who enjoy a little cynicism! There’s no real moral to this story, except perhaps that you should think twice before planning a birthday party for a hungry lion. Or maybe that bullies should beware that there’s always someone bigger. Or maybe that sometimes hiding is the wisest plan. 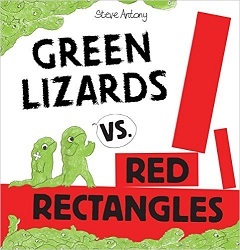 But moral or no, I place this picture book firmly in the “Delightfully Silly” category. It makes me laugh. 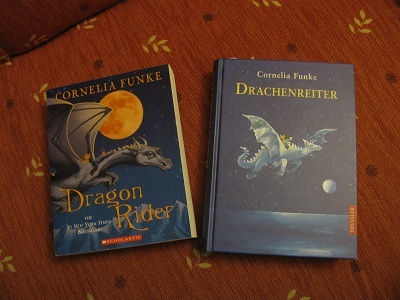 This week, we’re looking at Drachenreiter, by Cornelia Funke, known in English as Dragon Rider. It’s been a few years since I looked at Drachenreiter. We are ready to begin with Chapter Two, Versammlung im Regen, “A Meeting in the Rain.” This is Seite 14 auf Deutsch, page 7 in English. Da platzte Schwefelfell der Kragen. I like this one. I’ve heard people speak schnippisch. Bestimmt nicht genug, um dich mit dieser holzköpfigen Pilzfresserin zu Ende zu streiten. And that’s all for tonight! Please try not to call anyone a holzköpfigen Pilzfresserin this week! 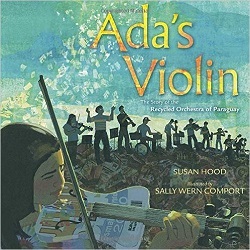 Candlewick Press, 2016. 263 pages. No one does quirky like Kate DiCamillo. And her quirky, unique, like-no-other characters are all the more real that way. Raymie Clarke has a plan. She wants to win Little Miss Central Florida Tire by learning to twirl a baton. Then her father will see her picture in the paper and come back from wherever he ran off to with the dental hygienist. At baton-twirling lessons, taught by Ida Nee, a former champion of multiple contests, Raymie meets Louisiana Elefante and Beverly Tapinski. Louisiana also wants to become Little Miss Central Florida Tire, but Beverly wants to sabotage the contest. First, they have very short-lived lessons together. Ida Nee doesn’t waste her time with lollygaggers and malingerers or fainters. But the girls start helping each other out. 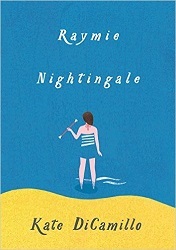 Raymie needs her library book on Florence Nightingale rescued from under a bed in a nursing home. (Now there’s a story!) And Louisiana wants to rescue her cat Archie from the Very Friendly Animal Center. All the adults they encounter along the way are quirky as well. Raymie’s mother is still mourning her father’s loss. Louisiana’s grandmother is an adventurous driver. Different adults in Raymie’s life offer her different kinds of comfort about her father’s abandonment. All the quirks make the story feel true. You end up loving these three girls and rooting for them as they stumble through as best they can, trying to follow a Bright and Shining Path. Together. Random House Children’s Books, 2016. 232 pages. Wow. I read this book on the first half of a flight to Portland, and sat stunned when I’d finished at just how rich and beautiful this novel is. There’s not really a moral to the story, but it’s beautiful. Memorable, luminescent, and beautiful. How does Gavriel Savit do it? One of the things he does is taking a unique character and then drawing wise conclusions about life. We meet Anna on November 6, 1939 — the day her father, a university professor, was required to attend a meeting that ultimately ended in his being taken to a concentration camp. She is seven years old. Anna’s father was a professor of linguistics at the Jagiellonian University in Krakow, and living with him meant that every day of the week was in a different language. By the time Anna had reached the age of seven, her German, Russian, French, and English were all good, and she had a fair amount of Yiddish and Ukrainian and a little Armenian and Carpathian Romany as well. Her father never spoke to her in Polish. The Polish, he said, would take care of itself. One does not learn as many languages as Anna’s father had without a fair bit of love for talking. Most of her memories of her father were of him speaking — laughing and joking, arguing and sighing, with one of the many friends and conversation partners he cultivated around the city. 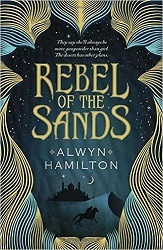 In fact, for much of her life with him, Anna had thought that each of the languages her father spoke had been tailored, like a bespoke suit of clothes, to the individual person with whom he conversed. French was not French; it was Monsieur Bouchard. Yiddish was not Yiddish; it was Reb Shmulik. Every word and phrase of Armenian that Anna had ever heard reminded her of the face of the little old tatik who always greeted her and her father with small cups of strong, bitter coffee. Every word of Armenian smelled like coffee. Anna very much wanted to avoid attention, and it was not long before she discovered the trick of doing so. A well-fed little girl in a pretty red-and-white dress immediately raises alarm if her face is covered with concern and effort, if she strains to see what is far ahead of her, if she moves only in fits and starts — and this was precisely what her present labor required her to do. At one intersection, though, she felt certain she had seen Monsieur Bouchard, her father’s old French friend, in the street ahead, and suddenly, impulsively, abandoning all effort of following the tall stranger, she smiled and ran gleefully toward the familiar man. In the end he was not Monsieur Bouchard, but the effect of this burst of glee was immediately apparent to her. When she passed through the street hesitantly and with concern, the grown-ups who saw her seemed to latch on to her distress, trying to carry it off with them despite themselves, and the strain of the effort would cause a kind of unwilling connection between the adult and the child until they were out of one another’s sight. For the most part Anna felt certain that their intentions were good, but it seemed only a matter of time before someone stopped her, and then she did not know what might happen. On the other hand, when she ran through the street with a smile of anticipation, passing adults still took notice, but they did not try to carry off her joy with them — instead it engendered a kindred kind of joy inside of them, and well satisfied with this feeling, particularly in the eternally threatening environment of a military occupation, they continued on their way without giving her a moment’s thought. 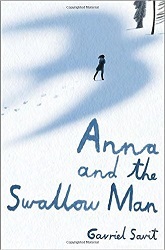 It was with joy, then, and not concern, that she followed the thin man past the guards at the outskirts of the city — they didn’t give her a second glance — and by the time Anna was alone in the twilit hills, this effort of counterfeiting happiness had brought to bear a true sort of excitement within her. You read that and realize that this is true. This would work. So universality and particularity combine with lovely language — and the result is this amazing book. It’s a war story, and doesn’t really have an obvious moral, though there are certainly morals you can pull out of it. I’m not crazy about the ending, and some terrible things happen along the way, things that will wrench your heart. But this book is truly beautiful. Everyone should read this book. When you’ve done so, please tell me what you think! Houghton Mifflin Harcourt, Boston, 2015. 210 pages. This book was published in 2015, so it was written before the election season got going, but it has strong political repercussions. The book puts faces on extreme poverty, but the approach is a scientific one. Nothing here is sensationalized. The authors took statistics and facts, then dug deeper to give an understanding of what’s going on so that such deep poverty has become so widespread. At the end, they offer some ideas for things we can and should do about this. This book is based on academic studies and census data. 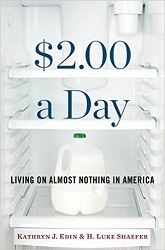 In the 1990s, author Kathryn Edin did an in-depth study of welfare recipients. But in 2010, she found more families in much worse shape. In the summer of 2010, Edin returned to the field to update her work on the very poor. She was struck by how markedly different things appeared from just fifteen years before. In the course of her interviews, she began to encounter many families living in conditions similar to those she would find when she met Susan and Devin Brown in 2012 — with no visible means of cash income from any source. These families weren’t just poor by American standards. They were the poorest of the poor. Some claimed food stamps, now called SNAP, for the Supplemental Nutrition Assistance Program. A few had a housing subsidy. Most had at least one household member covered by some form of government-funded health insurance. Some received an occasional bag of groceries from a food pantry. But what was so strikingly different from a decade and a half earlier was that there was virtually no cash coming into these homes. Not only were there no earnings, there was no welfare check either. These families didn’t just have too little cash to survive on, as was true for the welfare recipients Edin and Lein had met in the early 1990s. They often had no cash at all. And the absence of cash permeated every aspect of their lives. It seemed as though not only cash was missing, but hope as well. Edin dug deeper and met Luke Shaefer, a leading expert on the Survey of Income and Program Participation (SIPP). That fall, during an early morning meeting in her office in Cambridge, Edin shared with Shaefer what she had been seeing on the ground. Shaefer immediately went to work to see if he could detect a trend in the SIPP data that matched Edin’s observations. First, though, he needed to determine what income threshold would capture people who were experiencing a level of destitution so deep as to be unthought-of in America. Accordingly, he borrowed inspiration from one of the World Bank’s metrics of global poverty in the developing world — $2 per person, per day. At the time, the official poverty line for a family of three in the United States worked out to about $16.50 per person, per day over the course of a year. The government’s designation of “deep poverty” — set at half the poverty line — equated to about $8.30 per person, per day. As far as Shaefer and Edin could tell, no one had ever looked to see whether any slice of the American poor fell below the even lower threshold of $2 a day for even part of a year. With the SIPP, it was fairly easy to estimate how many American families with children were reporting cash incomes below this very low threshold in any given month…. The results of Shaefer’s analysis were staggering. In early 2011, 1.5 million households with roughly 3 million children were surviving on cash incomes of no more than $2 per person, per day in any given month. That’s about one out of every twenty-five families with children in America. What’s more, not only were these figures astoundingly high, but the phenomenon of $2-a-day poverty among households with children had been on the rise since the nation’s landmark welfare reform legislation was passed in 1996 — and at a distressingly fast pace. As of 2011, the number of families in $2-a-day poverty had more than doubled in just a decade and a half. It further appeared that the experience of living below the $2-a-day threshold didn’t discriminate by family type or race. While single-mother families were most at risk of falling into a spell of extreme destitution, more than a third of the households in $2-a-day poverty were headed by a married couple. And although the rate of growth was highest among African Americans and Hispanics, nearly half of the $2-a-day poor were white. One piece of good news in these findings was that the government safety net was helping at least some households. When Shaefer added in SNAP as if it were cash — a problematic assumption because SNAP cannot legally be converted to cash, so it can’t be used to pay the light bill, the rent, or buy a bus pass — the number of families living in $2-a-day poverty fell by about half. This vital in-kind government program was clearly reaching many, though not all, of the poorest of the poor. Even counting SNAP as cash, though, Shaefer found that the increase in the number of families with children living in $2-a-day poverty remained large — up 70 percent in fifteen years. And even after throwing in any tax credits the household could have claimed in the prior year, plus the cash value of housing subsidies, the data still showed a 50 percent increase. Clearly, the nation was headed in the wrong direction. Reflecting on these numbers, we, Shaefer and Edin, sought out even more confirmation that what we had found represented a real shift in the circumstances of families at the very bottom. With this in mind, we began to look for other evidence, beyond the SIPP, of the rise of $2-a-day poverty. Reports from the nation’s food banks showed a sizable rise in the number of households seeking emergency food assistance since the late 1990s. A look at government data on those receiving SNAP revealed a large increase in the number of families with no other source of income. And reports from the nation’s public schools showed that more and more children were facing homelessness. Taken together, these findings seemed to confirm the rise of a new form of poverty that defies every assumption about economic, political, and social progress made over the past three decades. Statistics can help identify troubling trends like these, but they can’t tell us much about what’s going on beneath the numbers. In fact, these statistics led to more questions than answers. What had caused the rise in $2-a-day poverty among households with children? Was the landmark welfare reform of 1996 partly to blame? Were these families completely detached from the world of work? Or were they enmeshed in a low-wage labor market that was itself somehow prompting spells of extreme destitution? How was it even possible to live without cash in modern America? What were families in $2-a-day poverty doing to survive? And were these strategies different from those poor families had been using prior to welfare reform, when AFDC still offered such families a cash cushion against extreme destitution? What was so indispensable about cash — as opposed to in-kind resources such as SNAP — for families trying to survive in twenty-first-century America? In 2012, they launched an in-depth study in four different areas in America. In each of these places, we looked for families with children who had spent at least three months living on a cash income of less than $2 per person, per day. In most cases, these spells of such dire poverty proved to be much longer. We visited with these families over the course of many months — and, in some cases, years — talking with them frequently, sharing meals, and observing their daily lives. As common themes emerged from their stories — such as their surprisingly high level of attachment to the formal labor market and the frequency with which doubling up with family or friends precipitated a spell of $2-a-day poverty — we looked back to the SIPP and to other sources of data to see if we could see them there as well. In the end, we followed eighteen families, eight of them featured here. As had been true of those Edin first encountered in the summer of 2010, some of these households received SNAP or lived in subsidized housing. But others weren’t getting even those benefits. During the course of our fieldwork, some of these families escaped $2-a-day poverty; others did not. Most escaped only to fall back into extreme destitution again. The book does show the reader these families, helps the reader understand what’s going on, puts faces on this level of poverty. Rather than demonizing the poor as just looking for government hand-outs, we can see and begin to understand how people can get trapped in this. America’s cash welfare program — the main government program that caught people when they fell — was not merely replaced with the 1996 welfare reform; it was very nearly destroyed. In its place arose a different kind of safety net, one that provides a powerful hand up to some — the working poor — but offers much less to others, those who can’t manage to find or keep a job. This book is about what happens when a government safety net that is built on the assumption of full-time, stable employment at a living wage combines with a low-wage labor market that fails to deliver on any of the above. It is this toxic alchemy, we argue, that is spurring the increasing numbers of $2-a-day poor in America. A hidden but growing landscape of survival strategies among those who experience this level of destitution has been the result. At the community level, these strategies can pull families into a web of exploitation and illegality that turns conventional morality upside down. None of the people whose stories appear in this book see a hand-out from the government — the kind that the old system provided prior to welfare reform — as a solution to their plight. Instead, what they want more than anything else is the chance to work. They would like nothing better than to have a full-time job paying $12 or $13 an hour, a modest dwelling in a safe neighborhood, and some stability above all else. In the 1990s, we, as a country, began a transformation of the social safety net that serves poor families with children. More aid has been rendered to a group that was previously without much in the way of government assistance — the working poor. Extending the nation’s safety net in this way has improved the lives of millions of Americans. But there are simply not enough jobs, much less good jobs, to go around. And for those without work, there is no longer a guarantee of cash assistance. $2.00 a Day shows that the transformation of the social safety net is incomplete, with dire consequences. We believe the time has come to finish the job. Doing something more to help these families won’t be easy; it will require a commitment by all of us. The government’s emphasis on personal responsibility must be matched by bold action to expand access to, and improve the quality of, jobs. But there will always be circumstances in which work as a primary approach to alleviating poverty won’t work. In those cases, we need a system that truly acts as a safety net for families in crisis, catching them when they fall. The bulk of the book looks at the lives of these eight families in detail. It helps you understand and feel the pain of the plight they face. You have to admire some of the creative ways they’re finding to survive. The authors particularly look at things like “perilous work” — jobs that even endanger health, that don’t offer reliable hours and terminate employment at the slightest “offense.” They look at housing problems and cobbled-together solutions, and what the poor will do to try to keep their children safe. This is an academic study, but the authors are good at telling the stories of the people they encountered. In their chapter on solutions, the authors don’t advocate going back to welfare, since it robbed people of their dignity and self-worth. They point out that the Earned Income Tax Credit has the opposite effect. In-dept interviews with 209 EITC claimants in the Northeast and Midwest in 2007 showed that while TANF receipt confers stigma and shame, claiming the EITC gives people dignity and restores their pride. First, the EITC is tied to employment. Second, tax credits are included as part of your federal tax refund — along with wages that were overwithheld. This lends the impression that the government benefit is “earned,” a just reward for hard work. Third, you don’t have to go to a welfare office to apply — an address that in and of itself connotes stigma. Instead, roughly 70 percent of EITC beneficiaries find their way to a professional tax preparation firm such as H&R Block, Liberty Tax Service, or Taxman. There you are not a supplicant. Instead you are a customer, there to claim your tax refund like any other American. I could relate to this because, when my husband joined the Air Force, before I found a job at our new assignment, we qualified for WIC. But to get the benefits, we had to sit through a “class” teaching about nutrition, and all the staff pretty much treated the applicants as idiots. I never went back. Fortunately, I found a part-time job, but I remembered that getting this government assistance meant giving up my dignity. (The Earned Income Credit, though, was another story.) That’s one thing I love about libraries. We offer help to all, and there is no shame tied to it. We are not arguing here that the EITC is a solution to $2-a-day poverty. But it does offer a critical lesson in how antipoverty policy ought to be crafted. Too often, America has gone down the road of trying to shame those in need. We’ve put up barriers. We’ve made people jump through hoop after hoop — all based on the not-so-subtle presumption that they are lazy and immoral, intent on trying to put something over on the system. TANF is a perfect example. Yet research shows that the intrusive treatment people typically receive at the welfare office can undermine their confidence in government and erode political participation. It stands to reason that this kind of treatment could also erode the very confidence that is so necessary for pulling yourself out of $2-a-day poverty. Shame may act as a barrier to claiming that little bit of cash that might stop a downward spiral. As a nation, the question we have to ask ourselves is, Whose side are we on? Can our desire for, and sense of, community induce those of us with resources to come alongside the extremely poor among us in a more supportive, and ultimately more effective, way? There are many more ideas of things we can do in that final chapter. Our approach to ending $2-a-day poverty is guided by three principles: (1) all deserve the opportunity to work; (2) parents should be able to raise their children in a place of their own; and (3) not every parent will be able to work, or work all of the time, but parents’ well-being, and the well-being of their children, should nonetheless be ensured. There’s so much more in this book I’d like to copy out. Don’t rely on my review, because you’ll miss so much. This book is worth reading! It’s impeccably researched and clearly presented, and it will stir your heart. Sonderling Sunday – The Duel Begins! It’s time for Sonderling Sunday, that time of the week when I play with language by looking at the German translations of children’s books. 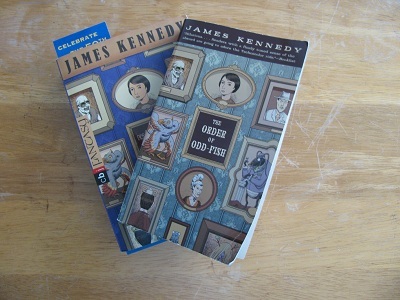 This week it’s back to the most Sonder book of them all, Der Orden der Seltsamen Sonderlinge, also known as The Order of Odd-Fish, by James Kennedy. Last time, and the time before that, we were inside the Dome of Doom, getting ready for a momentous duel between Fumo, the Sleeping Bee, versus Zam-Zam, the Dancing Ant of Sadness. The duel was preceded by ritualized insults and threats, which were most entertaining in German, I must say. = Die beiden Duellanten waren auf ihre Strauße gestiegen. “The crowd roared.” = Die Menge tobte. “The crowd howled with delight.” = Die Zuschauer johlten vor Begeisterung. = Ich würde sie liebend gern ein bisschen zurechtstutzen. Huh. That’s funny. At the bottom of page 337, “whispered Audrey” is translated flüsterte Orwell. Either that’s a mistake, or I forgot that Audrey’s last name is Orwell. “The smell of sweat!” = Der Geruch von Schweiß! “The smell of ostrich poop!” = Der Geruch von Straußenkot! “What a kid!” = Was für ein Prachtkerl! = Dieser Junge verschwendet wirklich keine Worte. “ya big lug!” = du Knilch! = Eine Hand wäscht die andere, sagt man nicht so? = Betrachte dich als herausgefordert! = Das mit Schuh war nur ein kleiner Scherz von mir. I challenge you to use that in your conversation this week! Till next time! Bis bald! You are currently browsing the Sonderbooks blog archives for May, 2016.